Instagram, thanks to its widespread popularity among smartphone and tablet users, has become a treasure trove of amazing images showcasing special moments in our lives. As the vacation season is drawing to an end, chances are many of you have your Instagram accounts stacked with beautiful albums full of vacation photos – exotic beach escapes or crazy beach parties with your friends, breathtaking places around the globe, backpacking through Europe, captures of funny moments with your kids on a family camping trip, and so on. – a digital photo album can easily be printed and shared in the most traditional way. Printed album is a great gift for grandpas and grandmas! – You can enjoy a digital photo album without an Internet connection, on any device, running on any operating system. – PDF format is great for archiving and making backups of important files, such as vacation and family photos. But is it actually possible to create a PDF album from Instagram photos? The good news is that it is. 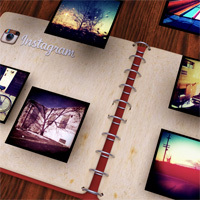 As a matter of fact, it is pretty easy to turn your Instagram photos into a digital photo album, saved in a PDF. Click on the ‘Follow user’ button. Simply enjoy your images anytime and wherever your wish. As you can see, it is fairly simple to download and save your Instagram shots to your local hard drive. As the name says, Save-o-gram lets you download and save your favorite Instagram photos and videos in three easy steps. There is an option to download one, more or all photos from any Instagram account in their original or in a zip file format. When you are done, if you wish you can share or even print selected photos and enjoy them for life. InstagramDownloader is an open source desktop software for downloading Instagram pictures. It runs on Windows OS, so if you are a Windows user, it is a good option for you. Once you’ve got all your pics safely saved on your local hard drive, it is easy enough to create an awesome digital photo album. We have prepared a detailed, step-by-step how-to guide for creating PDF albums with PowerPoint. You can find it here. The tutorial is written using the Microsoft Office 2010 version, but it is consistent with the latest version of the MS Office (for Office 365 subscribers and MS Office 2013 users).